GARDAÍ HAVE ISSUED 500 fixed penalty notices for speeding since works have commenced on the M7 motorway between junction 8 Johnstown and junction 11 outside Newbridge, and have issued an urgent appeal to motorists using the route. Two speed vans are set to be employed to deter motorists from speeding after recent incidents have seen very high speeds, poor lane discipline and vehicles breaking through crash barriers. In recent month, 32 motorists have been prosecuted for dangerous driving on that stretch of road. While none of these incidents has resulted in a fatality to date, gardaí said a number of them in recent times have been serious. In the past week alone, a truck has crashed through a barrier in an effort to avoid slowing traffic up ahead. Separately, a van collided with a barrier and landed in the works area. These and other traffic incidents are causing significant delays to road users on the route. From Monday, onwards, the speed vans will be deployed to “further enhance enforcement activity by local roads policing units”. 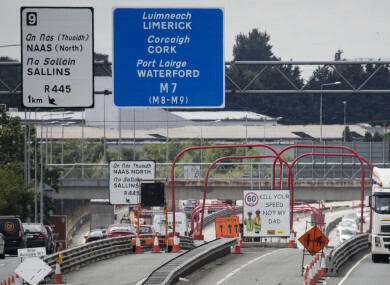 “This measure is being deployed to further deter motorists from breaking the 60kph speed limit in a renewed effort to keep both drivers and those carrying out works on the route safe,” gardaí said. Email “Gardaí to deploy two speed vans after a number of serious incidents on M7 in Kildare”. Feedback on “Gardaí to deploy two speed vans after a number of serious incidents on M7 in Kildare”.